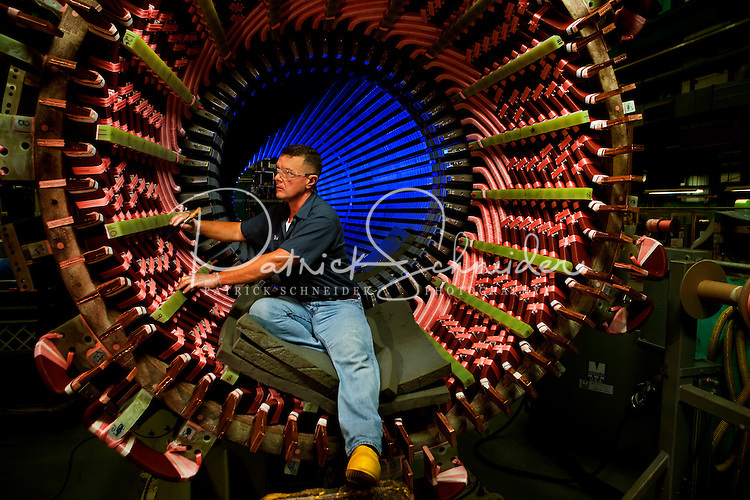 An employee of Siemens Charlotte Turbine-Generator Center in the Stator winding area inspects the electrical coils inside stator, which is the stationary part of a generator's rotor system. Siemens state-of-the-art generator manufacturing operations include new-unit generator manufacturing as well as service repairs for steam turbines and generators. The Charlotte NC manufacturing facility was founded in 1967 by Westinghouse Electric Corporation to manufacture nuclear low pressure turbines. Siemens Charlotte plant is the primary service center for generator and steam turbine equipment in the Americas, and the lead plant for manufacturing new electrical generators. Internationally, Siemens AG is Europe's largest engineering conglomerate.